Hey there and happy Friday! It actually feels like fall this morning - the air is crisp and a wee bit chilly. I thought this would be the perfect card to share today. 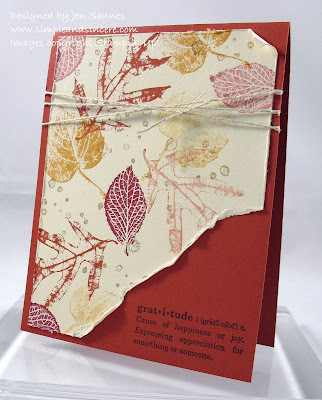 This is one of the cards we will be making tonight at my stamp-a-stack. I love, love, love this set from the Holiday Mini Catalog called French Foliage. I have this thing about leaves and I haven't seen any leaf/fall stamp sets that I have been this excited about in a LONG time. This was a super quick and easy card to put together and I'm hoping the ladies enjoy making it at my classes this weekend. Well, Jevin was off to school yesterday - his first day of first grade. Here is my little man - he is getting so big! That's all for today - have a fantastic Labor Day weekend. See you soon! I bet that card was a big hit at your stamp-a-stack. It's very pretty.